As in Buddhism, the mind is crucial in daily practice with life challenges. Unlike Buddhist meditation with specific instructions in sitting, Chuang Tzu’s writings describe “sit and forget” as not clinging to physical form and removing wits in the mind. Connect with free flowing energy of oneness in the world. This is the void or empty mind waiting for things to come. Stop listening to the ear or mind to find what is in accord with our preconceived opinions or ideas but listen with energy. Forget form, emotions, self and others, then integrity develops and Tao is attained. We are consumed by emotions when we think of “I, me, mine” or our ego, the body, any material form or comparing others with ourselves. According to Chuang Tzu, supreme integrity is no self, name and merit or self interests for gain. The same words are found in Lao Tzu’s Tao Te Ching. When people forget each other and focus on abiding in Tao, there would not be any conflicts. 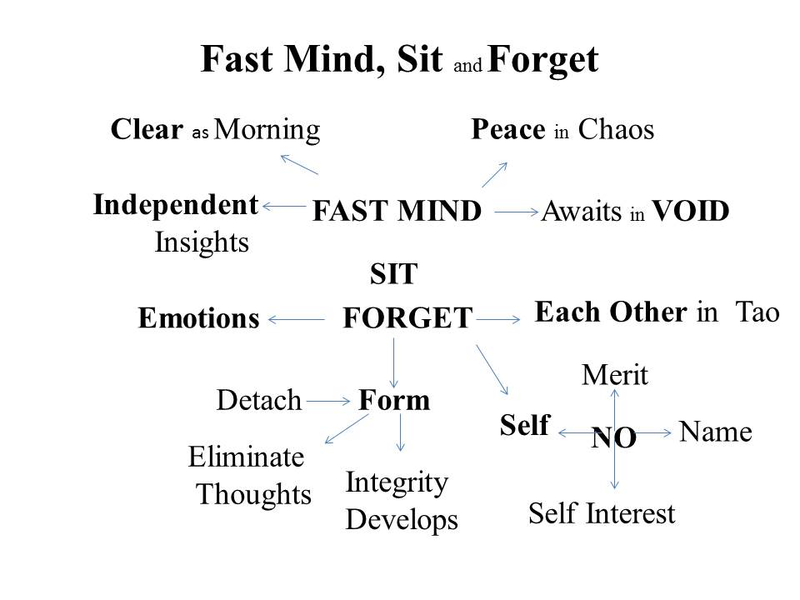 Along with “sit and forget” or “mind fast” unique to Chuang Tzu, in his writings he also coins other terms referring to the state of mind, namely: “clear as morning”, “independent insights” and “peace amidst chaos” or stillness in motion. When our mind is open and void with nothing, it has clarity and can see things on its own without being influenced by anything else. Then the mind becomes independent, unwavering and free. This is what Buddhists strive to achieve with long hours of sitting meditation.